Style evolution has everything to do with body image and self-esteem . . . feeling good in what you have chosen to wear . . . along with lifestyle and work requirements. I am going through the process of my own style evolution because of lifestyle requirements and through this blog I have been analyzing that process. Since I have made some style resolutions this year, I decided to do some research on contemporary celebrities, both men and women, their looks and their style evolutions. The style evolution of Victoria Beckham has been pictorially represented on the Glamour magazine UK website. It wasn't until about slide 20 that I became interested - that's the photo that begins her "sophisticated" development. Although not everything after that point held my attention, it was an interesting cross-section of style evolution from, as the website coined it, Spicy to Sophisticated. Her sophisticated phase is influential and can be adopted by many, even those without her Size 0 physique. A couple of French bloggers, Ykone and Au Feminin, have also penned the evolution of Victoria Beckham, which is worth visiting if only to see the choice of photographs, if you don't read French (I read French but I don't always understand the nuances of what I read). Victoria Beckham wool twill coat. "Everything she wears is tailored to perfection" and "she is the master of minimalism" are two of the 15 reasons to love Victoria Beckham's style on Stylebistro.com. George Clooney, now in the 50+ age group, has had his style evolution pictorially represented by radar online. From 1990 to 2011, he has been depicted from an ordinary long haired bluejean-clad upstart to a debonair stylish gentleman actor. What a difference 21 years makes! The "carcoat" in grey is classic, timeless, constant and forgiving, to the point that if you are going to incorporate this style, do it in cashmere or fine wool, pay a bundle and you will wear it forever. 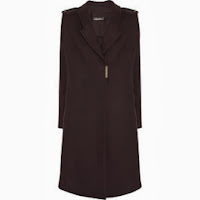 My husband chose one in camel many years ago and it is still my favourite outerwear look for a mild winter. In other photos I perused, Clooney does justice to the open shirt with a suit or blazer. Although I couldn't find a photo of him in a t-shirt, blazer and jeans, I think he would wear them well and that is an adoptable style combination for any man. When I think about the photographs of Charlize Theron that I have seen - skinny jeans with heels, often a blazer (even with boyfriend jeans as in this airport photo) and red carpet gowns come to mind. The red carpet looks may be mesmerizing, but are not the reality for 95% of the population. Realistically, the blazer with jeans is much more adoptable. I've always loved that blazer look and it has been part of my style inventory. Take the blazer away and even Charlize Theron might look frumpy - mmm no, I don't think she would ever look frumpy, excluding her dramatic roles such as Young Adult and Monster of course. 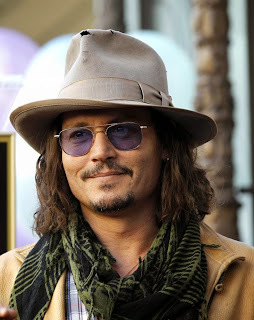 Wonderwall.msn looks at Johnny Depp's style evolution and he has done it all; nevertheless, the suit, the jacket, even if it happens to be a denim jacket, is always there. Now maybe Johnny Depp can get away with it but I would suggest that if you choose to add a hat to your style evolution, make sure it doesn't have holes in it. Part of a man's style is a t-shirt but it is the way he wears a t-shirt that is important. I have always liked that suit with a t-shirt thing. It looks successful but not too stuffy. Will you still need me, will you still feed me when I'm 64? (Lyrics, When I'm 64, Beatles). Will I still be wearing statement necklaces when I'm 90? One of my style resolutions, to wear more statement jewellery, has been inspired by Iris Apfel, self-proclaimed "geriatric starlet", who is 91 years old. I think the greatest fashion faux pas is looking into the mirror and seeing someone else. Relax. Have fun with your clothes! 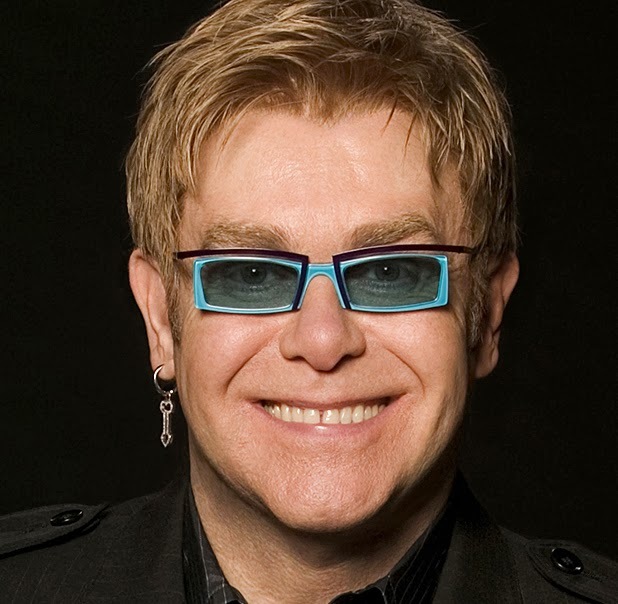 After writing the portion on Iris Apfel, I thought of Elton John whose style evolution has mellowed as he got older; whereas Apfel's became more flamboyant. There are 29 photos depicting Elton John's evolution on Biography.com. And so it is with us; perhaps not to either extreme. But I do know women who are taking the statement, "I should have worn red more often," to heart. Who are your contemporary style icons or perhaps style icons from the past? . . . I think there's a post there. Im big fan of Victoria's style! I am too - she has a "look" that is almost conservative at times and then she does something to surprise everyone. I like that.